Don't just wear niqab, tell a story! Charms, studs, zippers, you name it. 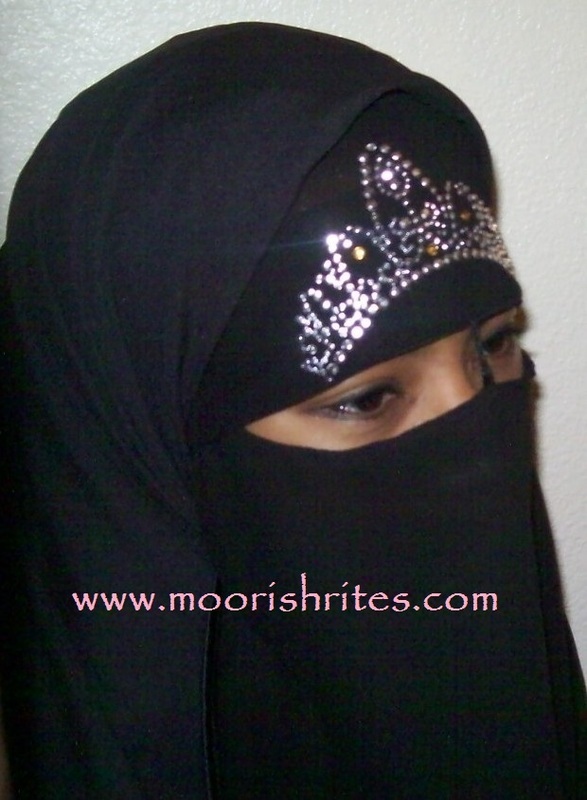 A niqab is a blank canvas through which you can create or express yourself. Send me a niqab and I'll hook it up for $20 or I'll use one of mine for $35.00. Once your order is placed allow up to 3 weeks for your order to be completed. If you have an idea that you don't see, contact us! Never leave home without your tiara! Bring out your edgy, raw side. Embroidery not included. Go native! Butterfly cowry shells on headband. Shisha mirror, Carved bone, African trade beads, and coins on each strand. There is one strand on both sides. "I'll Never Tell!" Functional Zippers. Bird and key charm. Charms optional. Extra $5.00 for charms. Keep things flowing with this pearl crown, cowry shell, embroidered combination.